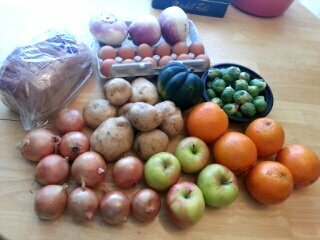 Apparently I put off making the CSA posts until the very last moment, i.e., when I’m getting ready to pick up the next week’s batch and I feel embarrassed. Take it from me, though, that the CSA veggies are so awesome that they can sit in the fridge for a full week and not suffer. We just ate the last of our mixed greens for dinner last night, and they were perfectly crisp and colorful. I let the kale from week 1 go for over two weeks and only a couple of leaves turned a mild, reproachful yellow around the edges. CSA veggies are very accommodating. 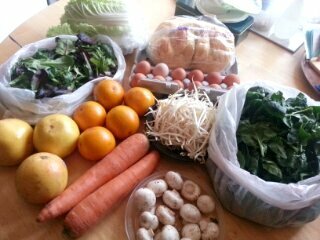 Week 3’s pickup consisted of: Napa cabbage, mixed greens, three grapefruit, five oranges, two enormous carrots, bean sprouts, mushrooms, spinach, dozen eggs, and loaf of bread (I picked challah). I think so far we’ve only consumed a couple of leaves of Napa cabbage (julienned and served with noodle soup), the mixed greens (side salads for two meals), the bean sprouts (again with the noodle soup), and the spinach and mushrooms. I like slicing the mushrooms, sauteing them with minced garlic in olive oil and butter, and then tossing the mess with wilted spinach. It’s a winning combination. 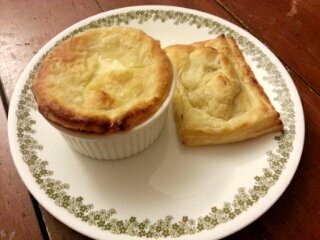 By the way, I love dealing with spinach, because it’s barely any work. Sure, it looks like a lot, and CSA spinach is so grimy that it needs an extra rinse in the salad spinner… but just cram it all into a pot, leaves still wet from washing, and turn the heat on medium. 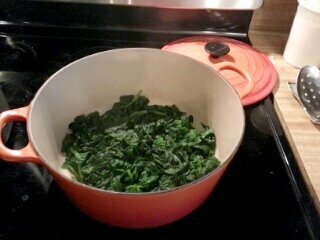 Ta-da, wilted spinach, all ready to be tossed with flavored oil and whatever else. 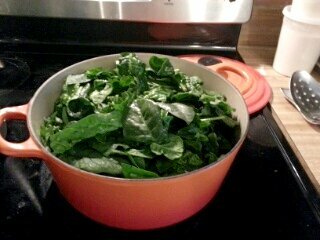 That huge mass of spinach, half of the CSA haul, barely covers the bottom of the pot when wilted down.